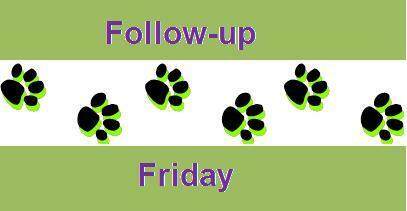 We are participating in Heart Like a Dog's "Follow-up Friday" Blog Hop. "The blog hop that lets you wrap up your week and leads you right into the weekend." Thanks again to Jodi for this fabulous idea. This first entry doesn't count as a real follow up because we haven't posted about it. But since we'll be 'following up' weekly on our progress and we have to start somewhere, this seemed an appropriate place. We are terrified proud to announce we have committed to joining You Did What With Your Weiner's 30/30 Challenge to walk for thirty minutes/day for thirty days. With a slight modification. The Challenge is supposed to be for both dog and owner but my dog is in the middle of a strict rehab/assessment protocol and only up to 15 minute walks at this point. (Long story - stay tuned.) Her 'mother', on the other hand, had a few too many Christmas cookies and really needed some motivation to get her act together and back on the treadmill. Well, I haven't gotten on the treadmill but I have gotten outside in the cold, cold, cold and walked my 30 minutes/day. It has not always been in one shot but I plan to change that now that I'm back in the routine of work and a regular schedule. For Bella's part, we have added brain games to her daily routine and we have done so every day since the Challenge began. She's getting her walks around the yard and is back in her "Agility for Reactive Dogs" class so she's on track and looking good. Our buddy, Roo, dropped by from Roo's Doins and asked if Bella was wearing a puppy snuggie in that picture. Pretty close, Roo, pretty close. We call it her bathrobe but it's really a towel. More specifically, it's the FURmitator's FUR Dry which you can read a review of here: Dog Tipper FUR Dry Review. Bonus: Bella doesn't care much (read: is mortified by) her Thundershirt, but this FUR Dry bathrobe seems to have the same calming effects on her that the T-shirt does for other dogs while drying her and keeping her warm at the same time. Go figure. And Roo noticed that Bella was wearing her EzyDog Chest Plate Harness in the picture. Good eyes, Roo. To answer your mom's question "Does it help with pulling?" Somewhat. It definitely makes me feel I have better control over Bella when she does pull and I don't worry about her hurting herself because the chest plate takes the brunt of the force and spreads it across her chest, rather than focusing on her shoulders/throat like some harnesses do. As to your question, "Is it comfortable? ", I'll have to ask Bella to answer that one. "Roof woof, roof, aroo, mumble." It looks comfortable and the chest plate is nicely padded and soft. It took a little while for Bella to figure out she needs to put her foot through one of the holes and I resisted using the harness for a long time just for that reason. I'm glad I finally took the plunge though as Bella seems to like it and I feel a lot safer with it on her. So I think that completes this week's follow up. If you do have questions on any of our posts, don't hesitate to ask and I'll try my best to answer them on Fridays. Thanks for dropping by and we hope you enjoy your weekend! PeeS - Jodi, if you happen to see this, you asked previously if we'd be interested in co-hosting the hop someday. While I have no idea what's involved in that effort, the answer is still definitely "Yes!" Let us know here or drop us an email. We really enjoy this idea and thank you for inviting us all to share in it. 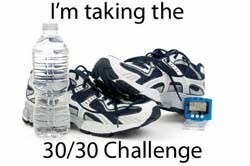 Congrats for joining the 30/30, we did too! Little Miss Pink Camo tolerates her EZDOG harness, however, Mom's not finding that the pulling has diminished much. Mom feels better not tugging on her neck though! Wonder if that towel thingie would help me with storm anxiety? Hey Jet, if you don't like the Thundershirt much, you can check out the Storm Defender Cape or, depending on what you don't like about the 'shirt, this robe/towel thingie, too. Hi Gizmo! Anything that gets me off the couch is good in my book - especially in January and February - the worst times for us. Look forward to traveling the road with you and checking in on your progress, too. Great FUF thank you for participating! I enjoy the wrap-up myself as it helps unclutter my mind which is a very good thing! Walking...that's on my list of goals too. I go in spurts where I walk regularly, and then something happens (like a hurt foot or a sick dog) and I stop completely. It is something I plan to get on track with again soon. Wow super extra credit to anyone committing to half hour out in our wintry weather. CindyLu and I are working on perfecting our mass-dash-out technique lol Brrr! I'm with you in not caring about getting snow. Some big, pretty flakes came down today and all I could think of was Spring! Hi Jodi, thanks for giving us the opportunity to participate. I like this idea. I think you probably know D better than anyone else so you should trust your instincts about what sets her off. In Bella's case, there are multiple things that can get her going and there's little rhyme or reason between them. I have heard of dogs 'reprimanding' (?) other dogs for their bad behavior but I don't have any experience with it. Actually, that's not true - my boy Beau was absolutely bomb-proof with other dogs but there was one time when he pinned a young Boxer to the ground. Everyone who witnessed it happen knew it was him telling the youngster his behavior was not acceptable. In fact, older dogs do that to younger dogs all the time. Maybe Delilah is just an 'old soul'?